You can fish anywhere, anytime with the Silver Fishing Pen, a compact fishing rod neatly contained in a realistic-looking ink pen case. 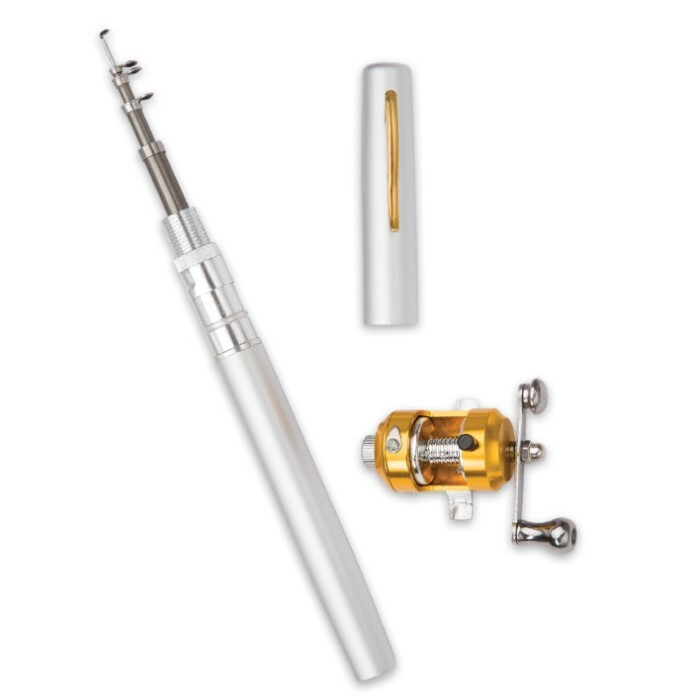 The fully-complete mini reel is made of aluminum alloy and brass and the rod is made of aluminum alloy and fiberglass. The rod telescopes out to 38” in length. 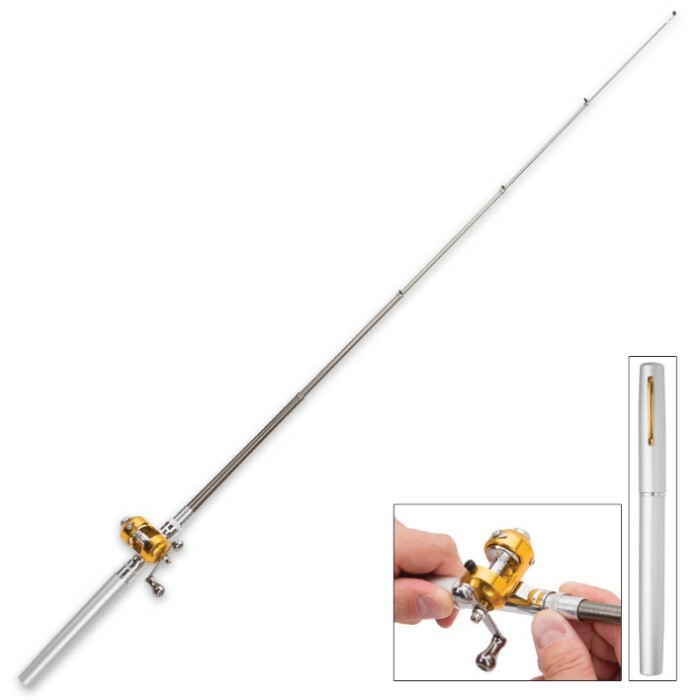 This compact rod and reel set is perfect for fishing off of a boat, a dock or on the ice. Drop one in your camping or hiking gear, fishing tackle, your vehicle or your bugout bag. 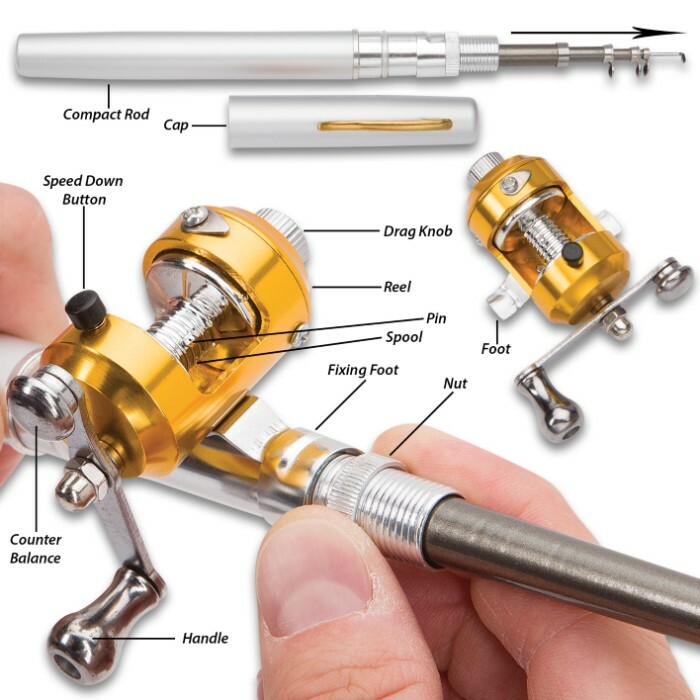 Fishing line is not included with the Fishing Pen. I bought this pole as an oddity. When I received it the action on the reel was very rough. But after I put a small washer between the housing and the crank handle it works great now. I can't wait until my great grandson and I will be able to attack the bluegill in the pond. To be honest, I bought 1 as a gag gift for my fishing nut friend. For weeks he's raved on about how it's one of the best birthday gifts I've ever gotten him. I thought he was feeding me bs. Nope! He takes it with him everywhere, tool box, suitcase, glove box, etc....... So I got another, for me. I now have it with me at all times too! Of course it's not a heavy duty rig, but great for panfish. Ordering another two, one for my little girl, and one to keep in my bug out bag. I have yet to spend $10 on anything else more fun and useful. 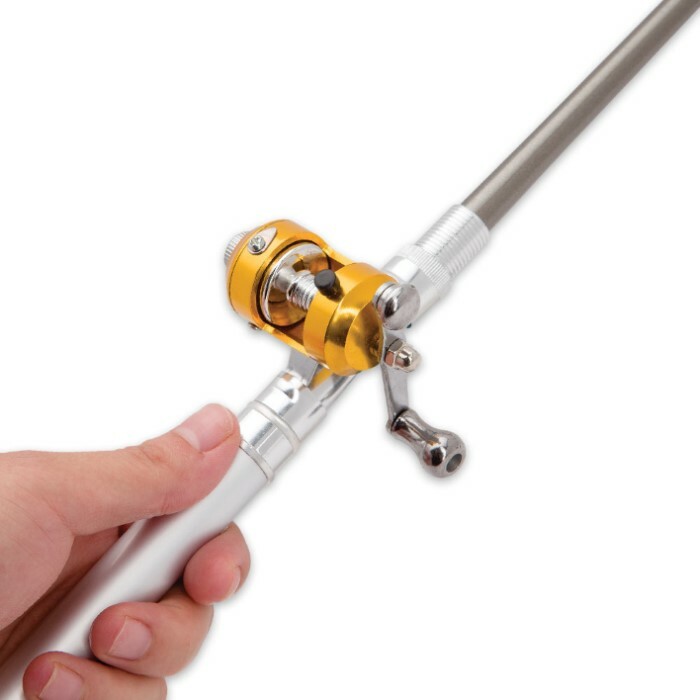 Obviously, it can't replace a $100+ freshwater rod & reel setup, but this little kit has surprisingly decent quality for the price point and can withstand about 2 pounds of weight, so it'll do fine for smaller fish like bluegill or sac-au-lait (crappie). The only catch is that it's not something you can set up and break down quickly, unless you simply leave off the cap and keep it assembled but collapsed; otherwise, you'll need to tie on and remove your tackle as needed. Still, it's a neat little gizmo that's good to have handy for unexpected opportunities to fish, or as a little backup rod for when nephews, nieces, grandkids or what-have-you want to tag along on the boat; it's usable enough, and at just $10 a pop, it's not gonna wreck your trip if it ends up lost or broken. I'm buying several more to give as gifts.